Ulica solar modules have high photoelectricity conversion efficiency and reliability. Ulica uses advanced diffusion technology, and ensures the uniformity of cell's conversion efficiency, good eletrical conductivity, good adhesive force, good electrode weldability, high-precision screen printing patternin and high evenness. Thus the cells are easy for automatic welding and laser cutting. The tolerance control of Ulica modules' output power is ±3%. 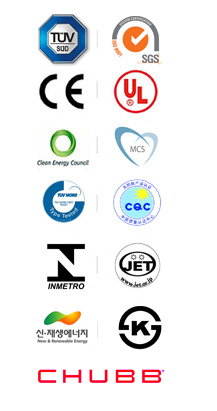 Ulica's modules have 10 years' material and workmanship guarantee and 25 years' power quaranty.Besides, Ulica has obtained many important international certificates, such as CE,IEC61215＆IEC61730/TüV,UL,ISO9001,CEC,and etc. Electrical parameters, mechanical properties, work conditions and products specifications are all concluded in the product datasheets, please click to download.